The manipulation of fire by early man was clearly a turning point for our ancient ancestors. Fire enabled warmth and light, protection from predators, and the exploitation of a new range of foods. Evidence originating from the 790,000-year-old Acheulian site of Gesher Benot Ya‘aqov (GBY) provides a unique opportunity to examine this fascinating issue. Photo 1: Burned grain of Aegilops cf. Geniculata. During carbonization (Figure from Goren-Inbar et al., 2004). Photo 2: Flint microartifacts - the content of a single sorted unit: A) The content; B) The ratio of burned items (left) to unburned (right). 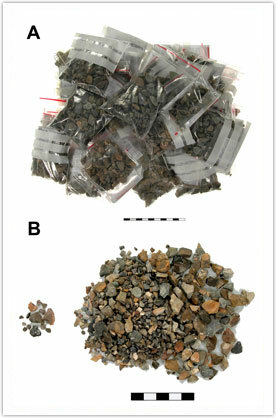 Burned flint items, burned wood, and pieces of charcoal (Photo 1) were observed throughout the stratigraphic sequence (Goren-Inbar et al., 2004). Most frequent are the burned flint microartifacts (smaller than 2 cm) that are an integral part of the archaeological deposits of GBY (Photo 2). A variety of experimental studies have demonstrated that exposure of flint to high temperatures (350-500ºC) results in distinctive thermal fractures (e.g., potlid fractures) that are easily identified through eyeball observations (Photo 3). In order to examine the cause of the burning (i.e., natural vs. anthropogenic fires), the spatial distribution of burned and unburned flint microartifacts was examined. We assumed that anthropogenic fires, in the form of hearths, result in spatially discerned clusters of burned material. This assumption draws from a variety of ethnographical, ethnoarchaeological, and archaeological observations of hearth-related activities and hearth-related discard patterns (Alperson-Afil et al., 2007). We carried out spatial analyses of flint items from fourteen archaeological horizons at GBY, using software available in the GIS package, in order to detect possible clusters of burned material. 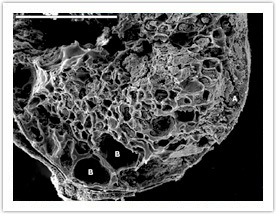 The spatial analyses established evidence for the spatial clustering of burned microartifacts(Photo 4). Photo 3: Flint microartifacts from Area C at GBY; burned on the left (A-D) and unburned on the right (E-H). The circumstances that introduced the burned material to the archaeological horizons were examined through a detailed exploration of fire ecology. The necessary conditions for a natural fire to ignite and spread at GBY would have had to include an ignition source (most likely a lightning strike), a dry interval in the cold-wet season (during which lightning strikes occur in the Mediterranean zone), availability of combustible fuel to allow heat transfer, and high combustion temperatures to allow evaporation of soil moisture in the waterlogged setting of GBY. If such a fire indeed occurred, we would expect this fire to consume the available fuels on the surface, evaporate the soil’s moisture, and extensively damage flint artifacts. The archaeological data, however, are not in accordance with such a scenario. If surface wildfires were responsible for the burning, we would expect to find high frequencies of burned material. The GBY layers yielded large quantities of unburned wood, an excellent fuel that would have fanned any wildfire. However, less than 1% of the wood segments (Goren-Inbar et al., 2002) and less than 2% of the carbonized wood pieces (Goren-Inbar et al., 2004) are burned. A low percentage of burning is also recorded in different lithic categories of flint pieces. Photo 4: Three-dimensional illustration of the relative densities of flint microartifacts in Area C, GBY: A) layer V-5, unburned microartifacts; B) layer V-5, burned microartifacts; C) layer V-6, unburned microartifacts; D) layer V-6, burned microartifacts. 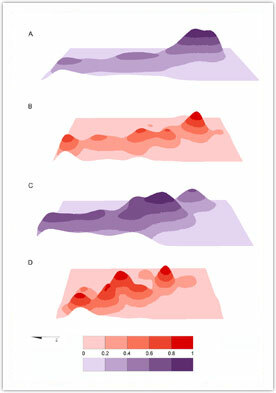 Relative densities have been standardized by the maximum values of each data set. Densities are represented as surfaces. The burning of the flint items at GBY required an intensive fire at relatively high temperatures, and in direct contact with the flints. The facts that fire damaged relatively low frequencies of flint items and that the burned flint microartifacts are found spatially clustered are suggestive of an anthropogenic fire. We interpret the clustering of burned flint microartifacts as phantom hearths, i.e., remnants of ancient hearths that are no longer visible. It appears that the hominids of GBY carried out flint-knapping activities in close vicinity to hearths, where some of the knapping waste was burned and was left in situ in the form of clusters of burned flints. 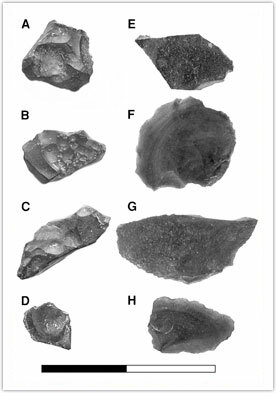 Thus, the study of burned flint items from the site suggests that the hominids of GBY had the knowledge of using this powerful tool as early as 790,000 years ago. Furthermore, when attempting to establish evidence for early use of fire, it is difficult to determine with certainty whether the fire was “collected” by hominins from a natural source or whether they had the ability to set fire at will. At GBY phantom hearths are recorded throughout the long occupational sequence of the site (Alperson-Afil, 2008), and it is unlikely that the Acheulian hominins were obliged to collect or re-invent it over and over again. Rather, the fact that fire was repetitively used suggests that the knowledge of fire-making and the technological skills of the Acheulian hominins of GBY enabled them to set fire at will and in diverse environmental settings on the damp lake shore. Thus, the evidence from GBY suggests that the ability to make fire was an integral part of the Acheulian tool kit. From a global perspective, the Acheulians of GBY are representatives of a fundamentally significant event in human evolution and dispersal. The site of GBY demonstrates the introduction of African stone-knapping traditions into the Levantine Corridor, reflecting a wave of human migration out of Africa. The recorded controlled use of fire at the site, in a geographical position midway along the route out of Africa and into Eurasia, further implies that the ability to control and maintain fire may have been a beneficial factor for human migration out of Africa. Alperson-Afil, N., 2008. Continual fire-making by hominins at Gesher Benot Ya‘aqov, Israel. Quaternary Science Reviews 27: 1733–1739. Goren-Inbar, N., Werker, E., Feibel, C.S., 2002. The Acheulian Site of Gesher Benot Ya‘aqov: The Wood Assemblage. Oxbow Books, Oxford.